Such has been the rate at which Bridge Road Brewers have been releasing the Brett-and-foeder fermented Mayday Hills beers – we're almost into double figures and it's not even 18 months since Yee Hah! kicked things off – we've not been totally on top of things. So, we'll wrap up two in one go here; sure, Elderflower has been out a while but there's likely still bottles out there and it's one of our favourites in the series to date. And what about it took our fancy? Well, as our notes say, it's a beer with plenty going on yet with a subtlety that's not always been there in the eclectic series to date. It's variously floral, herbaceous and both dry and sweet with aromas of nettles and rose water in the mix. It's peppery and possesses a tangy side as well as some funky, drying Brett-iness. If you were to categorise it, farmhouse saison would probably be closest to the mark. 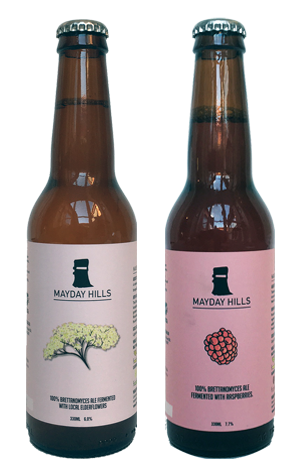 As for Raspberry (at least we assume it's called Raspberry as it comes with an image of one on the label and was brewed with them, this is a more aggressive addition to the Mayday Hills collection. Hazy and pink with a full white head, the raspberries present as both fruity and tart, while there's a distinctive dryness not dissimilar to that of Campari, potentially the result of both the Brett and the hopping regime. It's pretty acidic too, with a lingering back palate puckering dryness.